DEAR MAYO CLINIC: I have carpal tunnel syndrome that used to bother me only at night. Wearing a splint helped, but, now, my symptoms are noticeable throughout the day, as well. Does this mean surgery is inevitable, or are there other things I can do to help lessen the tingling and numbness it’s causing? ANSWER: Carpal tunnel syndrome is caused by pressure on the median nerve that’s in the front of your wrist. Treatment for carpal tunnel syndrome usually starts with splinting, self-care measures and, if needed, a corticosteroid injection. If that provides only temporary relief, then surgery may be recommended. The carpal tunnel is a small passageway on the palm side of your wrist. Nine tendons and the median nerve travel through the carpal tunnel. Those tendons are like ropes that control the movement of your fingers. The median nerve serves as a pathway for the sensations you feel in your palm, thumb, index finger, middle finger and outer border of your ring finger. It also sends the nerve signals that move muscles around the base of your thumb. Carpal tunnel syndrome happens when the space in the carpal tunnel becomes smaller or the tendons in the tunnel thicken, placing pressure on the median nerve. In its early stages, symptoms may include tingling or numbness in your thumb, index finger, middle finger and outer border of your ring finger. A wrist splint typically is the first step in carpal tunnel treatment. A splint can be particularly helpful for people whose symptoms bother them at night. Wearing a splint during the night can keep the wrist from bending while you sleep. That can relieve the nerve pressure and eliminate nighttime discomfort. When symptoms persist during waking hours, wearing a splint during the day can be useful. You also may be able to ease daytime symptoms by taking frequent breaks from repetitive activities. Throughout the day, take time to rotate your wrists, and stretch your palms and fingers. Taking a pain reliever, such as ibuprofen, naproxen or aspirin, may help lessen the inflammation of carpal tunnel syndrome. If those steps aren’t enough, then a corticosteroid injection into the carpal tunnel may reduce tingling and numbness. Corticosteroids lower inflammation and swelling within the carpal tunnel, which can relieve pressure on the median nerve. For those with severe symptoms or whose symptoms come back after an injection, surgery may be an appropriate option. 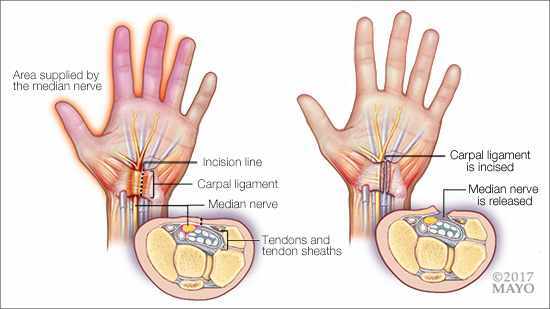 The goal of carpal tunnel surgery is to relieve pressure on your median nerve by cutting a ligament, called the transverse carpal ligament, pressing on the nerve. Traditionally, surgery for carpal tunnel syndrome has been performed as an open surgery in which a surgeon makes a small incision in the palm of the hand over the carpal tunnel and then releases the ligament. Alternatively, this procedure can be performed via endoscopic surgery. With that approach, the surgeon uses a telescope-like device with a small camera attached to it, called an endoscope, to see inside the carpal tunnel. The surgeon cuts the ligament through one or two small incisions in the hand or wrist. Ultrasound-guided carpal tunnel release is another alternative treatment in which a surgeon or a qualified physician uses ultrasound images to guide an instrument into the carpal tunnel through a small incision in the forearm, and then cut the ligament. As the techniques for ultrasound carpal tunnel release continue to evolve, the procedures may be able to be performed in a doctor’s office under local anesthesia.